Pop Singer Ariana Grande finally responds to the backlash she received for her song '7 Rings'. American singing sensation Ariana Grande once again lands in controversy. This time with a sensitive topic regarding cultural appropriation and racism. The pop icon recently released her new single '7 Rings'. And concerned with its lyrics that say 'You like my hair? Gee, thanks, just bought it', fans expressed their disappointments concerning its issues with racism and cultural appropriation, especially towards Asian and Black culture. As a matter of fact, the singer started receiving heavy backlashes just shortly after following the accusation from Princess Nokia and Soulja Boy of stealing her (Princess Nokia) song. The 26 years old singer reportedly shared a screenshot picture on her Instagram story that displayed a fan's post commenting on the 7 Rings lyrics. "White women talking about their weaves is how we're gonna solve racism"
Outraged fans were still not satisfied with the singer response. Nonetheless, Grande later removed the post from her IG story. A few hours later when The Shade Room, a celebrity account on Instagram published the same photo saying Ariana actually missed the point of her fans, Grande then appeared on the comment section to apologize. "Hi hi. 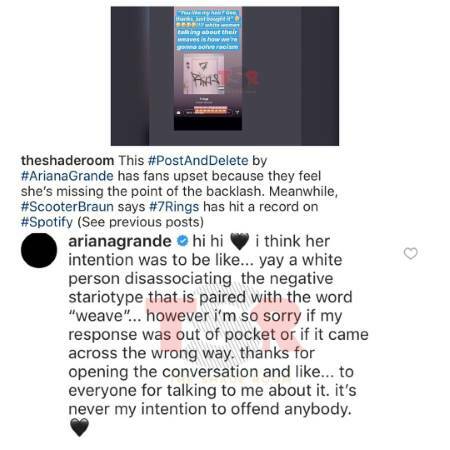 I think her intention was to be like… yay a white person disassociating the negative stariotype that is paired with the word ‘weave'…"
"however I'm so sorry my response was out of pocket or if it came across the wrong way. Thanks for opening the conversation and like… to everyone for talking to me about it. "It's never my intention to offend anybody." And obviously, hundreds of comments started to fill up under the same content. "the ariana grande blackface controversy is probably one of the dumbest things to happen on the internet"
Well, whilst the debate continues, at least it's proved that Ariana listened, but specifically, she learned and apologized. Kudos to Grande for that. Her hit song '7 Rings' is projected to debut in number 1 on Billboard charts after already being on the top spot in iTunes.